The "Heart of Béarn", land of customs and traditions, can be seen throughout the country in the stone and pebble buildings of the gaves. Here, the vineyard of Jurançon and the Béarn hills offer unique views of the Pyrenean peaks. A stopover is essential in Monein to see St Girons Church. It is the largest Gothic church in Béarn with woodwork peculiar to France. The heart of oak frame represents a medieval architectural style showing a capsized double-hull boat shape. Around the village, facing the Pyrenees, the vineyard of Jurançon's vines stretch to the top of the hills. While strolling around you can see one of Béarn's large houses made of pebbles and covered with slate, a characteristic of the traditional Béarn landscape. 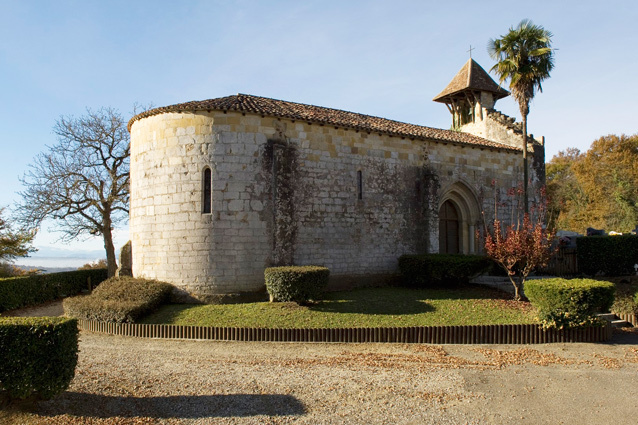 Our favourite spot is the Lacommande village, located on the Arles route of Santiago de Compostela, a commandery (a district controlled by a commander of a medieval order of knights) was founded by Gaston IV le Croisé in the 12th century. 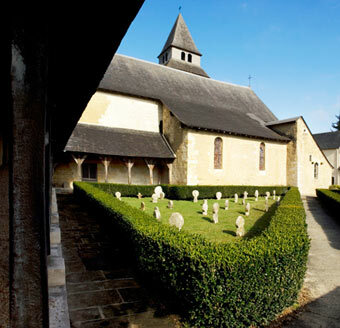 A cemetery, dotted with unique discoid steles typical to Béarn, surrounds the Roman church. Towards Lucq of Béarn, you can see a typical Béarn village in which St Vincent church houses a white marble sarcophagus dating from the 4th century. Heading north, on the hillside, Arthez of Béarn is a stopover on the Puy route. While wandering the small paths, three chapels illustrate the glorious past of the village, including the Caubin Chapel, former Commanderie built by order of Gaston IV during the 12th century. The Sauvelade Abbey, the tiles picon of Maslacq, lofts, wash-houses…there is so much to see. 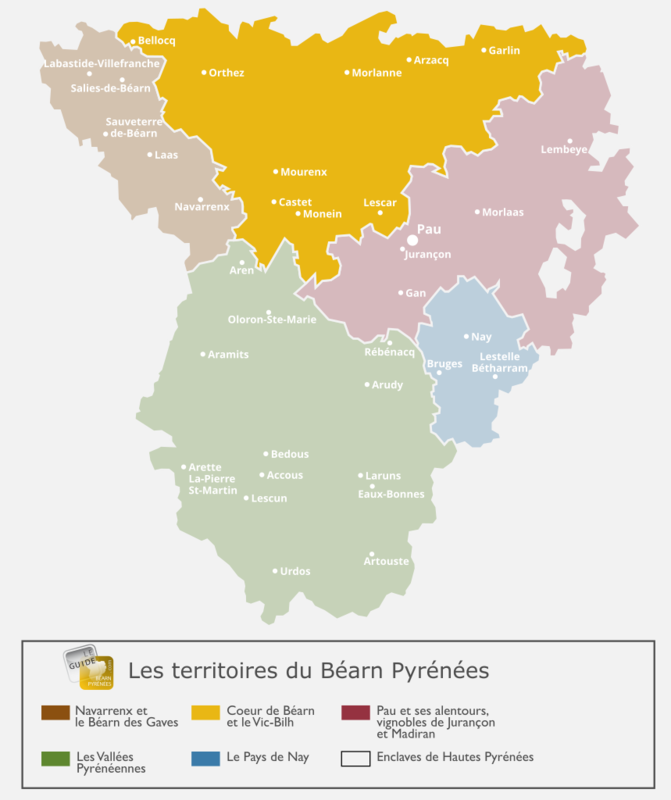 The “Heart of Béarn” should be explored on foot or by bike. While wandering the pathways you will find hidden treasures. Orthez is located on the Santiago de Compostela route. Like Pau, its big sister, the town was prosperous under Gaston Fébus. During the 13th and 14th centuries, Orthez became the capital after siezing it from the Gascons. Jeanne d'Albert, mother of Henri IV, built a protestant school which later became a university. This was suppressed during the reattachment of Béarn to France under Louis XIII. During the 18th century the town shaped itself as it is today; bourgeois houses and town houses with typical black rooves. There are many outstanding buildings to see. 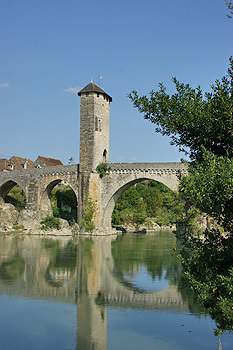 Visit the medieval bridge crossing the Gave de Pau and its surprising gate tower. The Tower of Moncade Castle, measuring more than 33m (108 feet) in height, dominates the entire town, The Jeanne d'Albert Museum tells the history of Protestantism in Béarn. This part of Béarn is full of beautiful villages and bastides either facing nearby Chalosse such Arzacq, or facing towards Gers to the east such as Lembeye, capital of the Vic-Bilh region, and close to the famous Madiran vineyard. 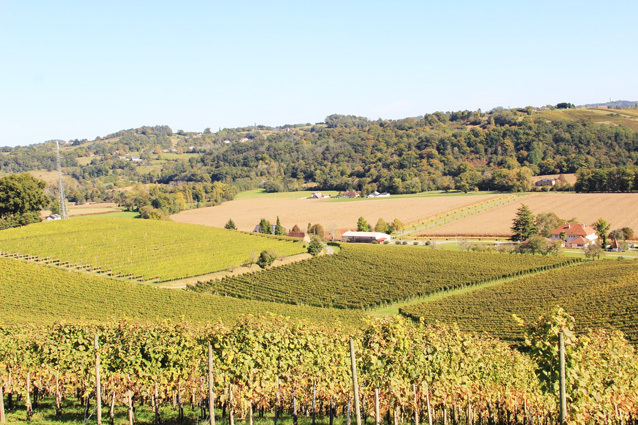 Jurançon is the other outstanding vineyard of the region. « Little Paris » was the nickname given by Henri IV to Monein. This is a village full of history it was economically prosperous during the 16th century with more than 5,000 inhabitants. In the centre of the village, the large square and the 16th century market hall is the legacy of a glorious past and many important fairs. A few steps away, the enormous St Girons Church, with its southern gothic style, proudly dominates the village with its 40 metres high bell tower. Built during the 16th century and a symbol of the power of the Monein village at that time, it is most famous for its heart of oak frame which represents the medieval architectural style. This titanic work lasted 70 years and required more than a 1,000 trees. A must be seen building that can be viewed throughout the year. To get to Lacommande, you need to cross the Jurançon vineyard and enter the forest. At the centre of the village, you can see a commandery created by Gaston IV during the 12th century to welcome pilgrims on the Arles route. Today, St Blaise Church, with Roman sculpture on the capitals representing biblical scenes, and the former hospital are listed historic monuments. Outside, the former cemetery and its 17th century stone sculpture steles, will intrigue you, their origin has not yet been discovered. Visiting Lacommande you can also visit the Jurançon Wine House, the fief of the independent wine makers located just in front of the church. Lucq de Béarn is located in the middle of the valleys. 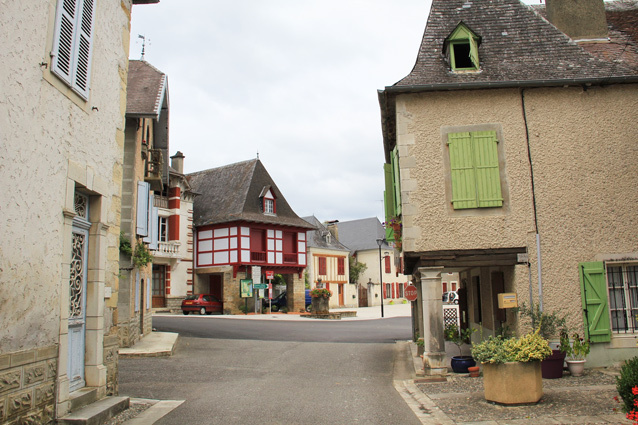 While strolling around this village you can see a traditional Béarn landscape. Typically houses are made of gave pebbles and the streets are narrow. Not far from the main square and its fountain, the St Vincent abbey church is a legacy of medieval life in the village, with capitals, an apse chapel dating from the 12th century and a bell-tower-porch dating from the 16th century. This church features a unique object: a 4th century white marble sarcophagus used as an altar. Climb the ridges and you will reach Arthez de Béarn, a popular town for the pilgrims on the Puy route heading towards Santiago de Compostela. In 1180 the Knights of Malta Order founded a commandery which was destroyed during the 16th century. 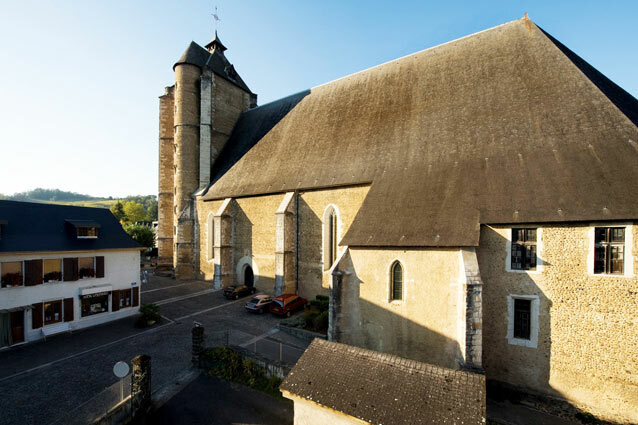 Today, you can see three chapels in the countryside of Arthez de Bearn: N’Haux, Cagnes and Caubin. Caubin chapel is the most beautiful building, with, in its nave, a gothic crypt housing a 14th century funeral sculpture. Look at vines on the hillside with the Pyrenees as a backdrop…It is a landscape to marvel at while wandering the Jurançon vineyard. Here, there are no large areas of land or big castles, but small plots of land nested between two forests offering unique views of the mountains and typical Bearn buildings. Jurançon wines are blended wines made from many grape varieties; the small manseng (white grape) produces a wine that is sweet and can be aged, and the large manseng produces a wine that is sweet and dry, to be consumed while it is young. Dry or sweet white wines are typical of the Jurançon vineyard. As for the winemaker, he is a passionate advocate of viticulture who talks about wine with love…You will be welcomed to their estates and they will share their passion with you. Monein wine' from the Jurançon vineyard is mostly found in the commune of Monein. In Lacommande you can visit the 'Maison des Vins et du Terroir in Jurançon'.